The rich are getting richer. The median annual income for the top 10 percent of Americans has increased 13.2 percent since 2001, while median wages in the 20th to 89.9th income percentiles have decreased during the same period. More than 75 percent of Americans carry some debt. The most common culprit? Credit card debt, which more than a quarter of Americans carry. 7.5 percent of all Americans have debt that are 60+ days past due. The lowest-earning 20 percent of Americans have a rate of almost double the national average, while the highest earning decile’s rate is below 1 percent. Nearly 95 percent of the highest-earning Americans have stocks, with average holdings of over $350,000. Only 11 percent of the lowest-earning 20 percent of Americans have any stocks, with average values of just over $6,000. Consumer prices are on the rise, the cost of homeownership continues to increase and credit card debt has hit record highs across the country. While some critics point to younger generations and their potentially frugal spending habits, what Americans spend might not be the problem at all. Despite inflated costs, American wages have largely remained stagnant in recent decades. Even when adjusted for inflation over the last 40 years, wage growth remains low and is quickly becoming one of the most important policy issues in the country. Despite these concerns, the number of Americans growing out of middle class status and into upper-middle class (or, put simply, becoming “rich”) is also growing. So how do they do it? 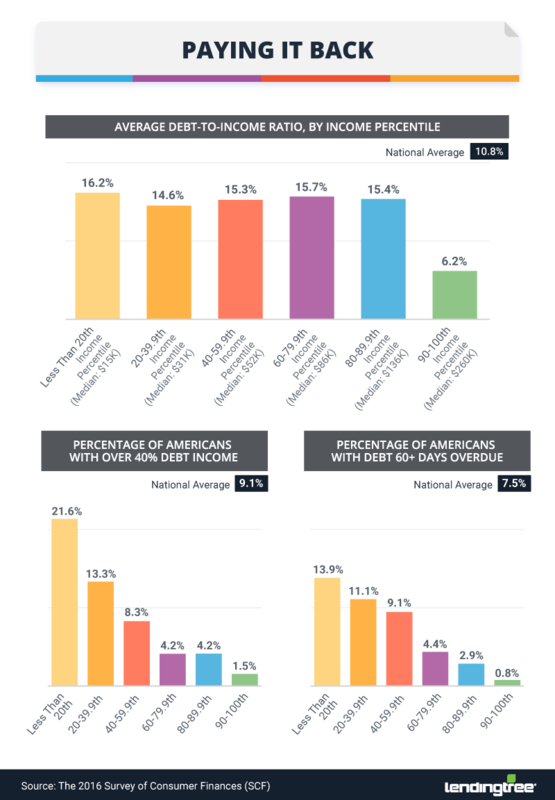 To learn more, we analyzed data from the Survey of Consumer Finances to understand the earning, spending and saving habits of Americans across the highest and lowest income brackets. Curious what the wealthy are doing to stay that way – or how they might be getting richer in today’s economic climate? Read on to see what we uncovered. The U.S. economy has changed dramatically since the turn of the millennium. Despite natural fluctuations, the stock market has risen exponentially since 2001, and unemployment was at its lowest point in this same time frame. After the Great Recession between 2007 and 2009, the pulse of American finances has been stronger than ever in more ways than one. Still, in spite of these national successes, not all Americans experience their benefits equally. Our analysis of the Survey of Consumer Finances using inflation-adjusted dollars revealed Americans in the 90th income percentile and higher earned $30,400 more in 2016 than in 2001. Rising from $229,800 to $260,200, their income increased by 13.2 percent. Americans earning less saw far lower increases and some decreases in income over the years. Even those in the 80th to 89.9th percentile only earned $2,200 more between 2001 and 2016, accounting for just a 1.6 percent increase in income. 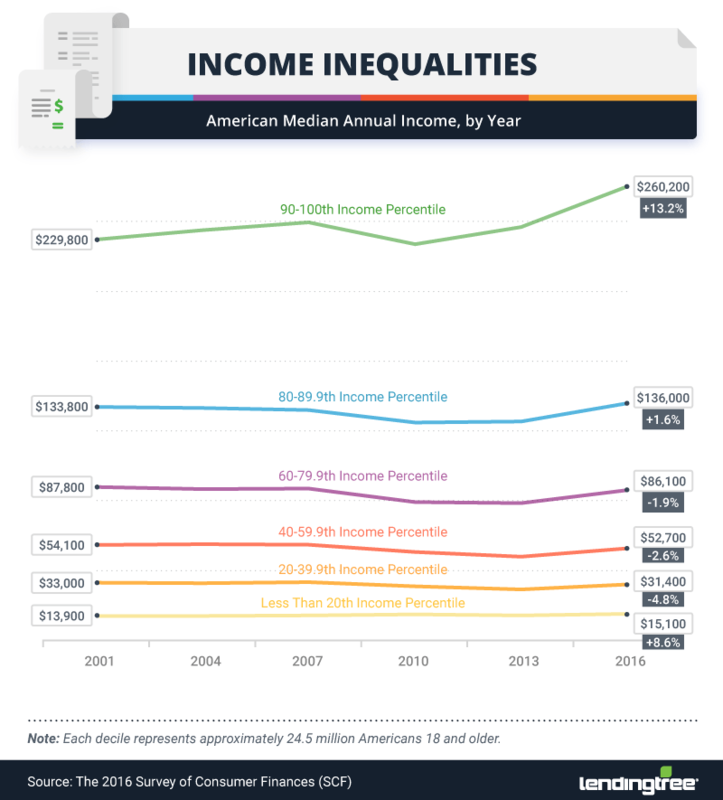 Americans in the bottom 20th percentile earned a median income of $13,900 in 2001, which only increased to $15,100 in 2016 – just 8.6 percent higher. In 2001, the average American earned more than 69 percent of their income from wages, and nearly 12 percent from businesses, farms or self-employment. After 15 years, however, those numbers have shifted. Less than 61 percent of American income in 2016 came from traditional wages. While businesses, farms or self-employment rose to 13.5 percent of income earnings, Social Security and retirement experienced the most dramatic increases. 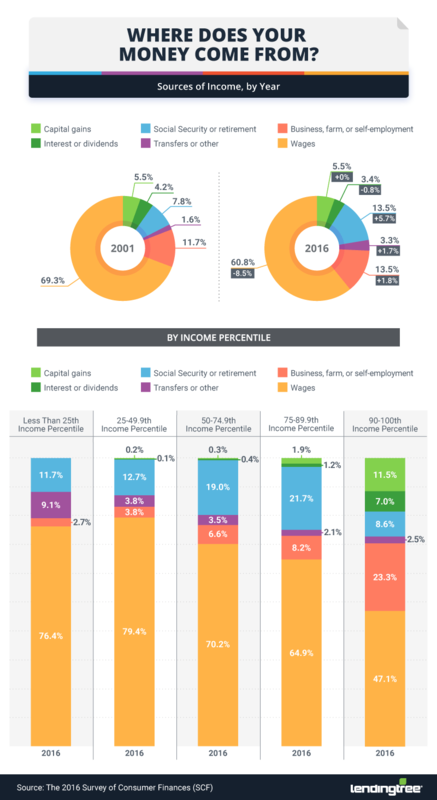 Accounting for less than 8 percent of income in 2001, 13.5 percent of U.S. income in 2016 was a product of Social Security and retirement funding. Over this 15-year time span, income from capital gains remained the same, while income from interest and dividends decreased from 4.2 percent to 3.4 percent. With income shifting over time, and many Americans experiencing only small percentage increases (or decreases, in some cases) in earnings over the last 15 years, debt distribution has evolved as well. In 2016, more than 3 in 4 families carried debt, ranging from credit cards to mortgages, student loans and car payments. Nearly 44 percent of Americans carried balances on their credit cards (a national deficit that continues to reach new highs year after year), more than the percentage of people making payments on a home or vehicle. Despite such wide ranges in income, a majority of Americans were responsible for similar levels of student loans regardless of their wealth. The cost of education is one of the most expensive investments Americans make, typically second only to homebuying. Combined, over 44 million borrowers across the U.S. owe more than $1.4 trillion in student loan debt. Without a proper budget, or when expenses exceed income, and you find yourself relying on credit cards to help make ends meet, debt can become an endless cycle that’s hard to break. While experts recommend balancing household expenses and cutting out unnecessary purchases as often as possible, some Americans give up a higher percentage of their total income-to-debt repayment. 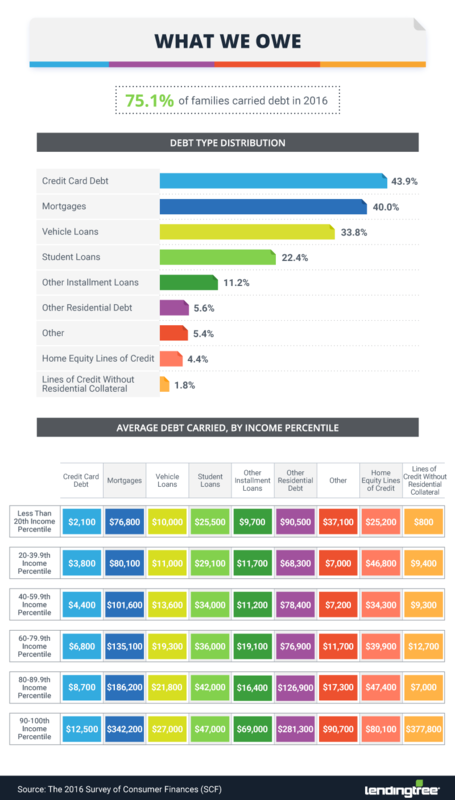 Those earning the most (in the 90th income percentile and higher) had more debt in nearly every category, but those expenses averaged just over 6 percent of their total income. In contrast, Americans earning less typically averaged a debt-to-income ratio between 14 and 16 percent. Americans earning the least (under the 20th income percentile) had the highest debt-to-income ratio, with more than 16 percent of their earnings spent on debt repayment. For some, the debt-to-income ratio can be even more dramatic. More than 9 percent of Americans spent over 40 percent their income on debt repayment, on average, including more than 1 in 5 of those under the 20th income percentile. Nearly 14 percent of these same Americans had debt that was 60 or more days past due. Regardless of how much money you earn or how much of that income is used to make payments on credit cards, mortgages or car payments, finding a way to contribute to your savings regularly is one of the most important financial habits anyone can establish. Having money for emergency scenarios (including medical expenses or an unexpected job loss) is important, but saving for retirement is crucial to every American’s financial future. 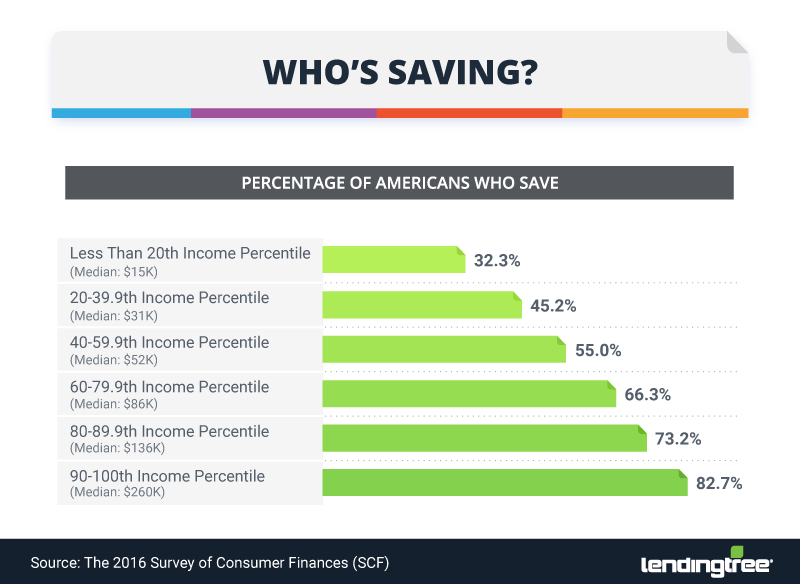 Unfortunately, regular saving was far more common among the highest-earning Americans than those earning the least. While nearly 83 percent of Americans in the 90th income percentile or higher found ways to save money, less than half of those in the 20th to 39.9th percentile had savings, and less than 1 in 3 of the lowest income earners put any money aside at all. Financial assets across the U.S. are measured in more than just savings or checking accounts. While transaction accounts make up a vast majority of American finances, retirement accounts, stocks, investments, savings bonds and other managed assets can also help contribute to people’s overall income. Diversified income among the wealthiest Americans most commonly included retirement accounts (nearly 92 percent), stocks (about 46 percent), pooled investments (over 37 percent) and cash-value life insurance (31 percent). The stock market can seem like a volatile and confusing place to invest, although negative stock market returns typically only occur in one out of every four years. Positive growth is more likely to outweigh loss, and resources are readily available to help newcomers learn how to invest with only a few dollars upfront. Despite the growth potential and even new and innovative smartphone apps designed to make the process even easier, stock holdings were far more common among Americans with the highest incomes. 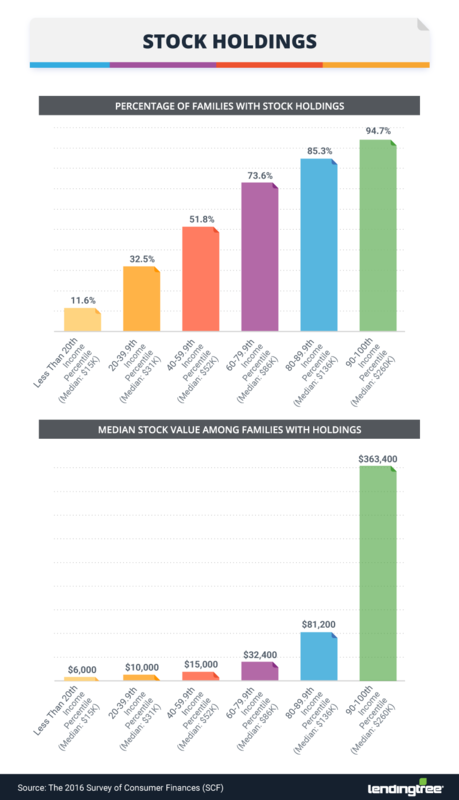 Nearly 95 percent of families in the 90th income percentile or higher invested in stocks. Those figures fell to 85 percent among 80th percentile earners and about 74 percent among Americans in the 60th to 79.9th income percentile. In contrast, less than 12 percent of Americans earning the least had any money in stocks, and those who did averaged just $6,000 in holdings. Between income, debt, savings and investments, the opportunity for many Americans to afford certain nonfinancial assets fluctuates wildly across the earnings brackets. 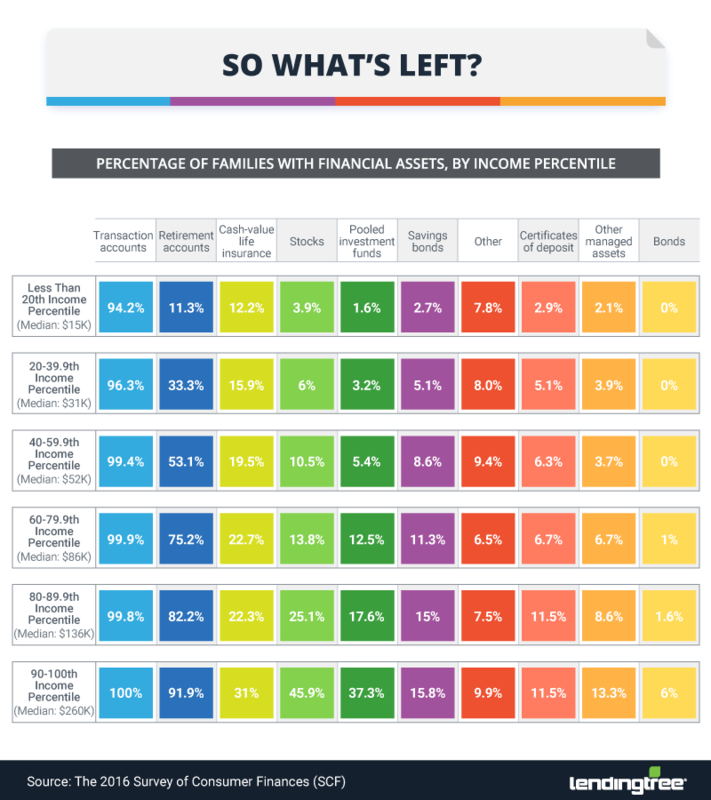 More than 90 percent of families earning within the 40th income percentile or higher had vehicles as nonfinancial assets, compared to 64 percent of the lowest-earning Americans. Primary residences and homeownership were far more common among Americans earning and saving more. While nearly 92 percent of the wealthiest Americans owned homes, less than 35 percent of families earning in the bottom 20th percentile could say the same. Secondary residential properties, business equity and other nonfinancial investments were also more common among Americans earning more. While affording the capital to own a home or an initial down payment can be one roadblock to homeownership in America, research show a vast majority of people find the homebuying process overwhelming and convoluted. In many states, paying a mortgage is typically less expensive than renting a home or apartment. After inflation adjustments, not all Americans made more money in 2016 than in 2001, but that hasn’t stopped the costs of housing and living from continuing to rise. While some low-income families have seen subtle increases in their income across this 15-year span, the wealthiest Americans are simply getting richer. Still, their wages alone may not tell the entire story. As our analysis found, high-income families still had debt considerations but were more likely to save money, diversify their income, invest in the stock market and afford nonfinancial assets like homes and cars. For many outside the top 90th percentile, high debt-to-income ratios and poor saving and investing habits may contribute to the wealth divide in America. At LendingTree, we’re here to help you find solutions that work to achieve your financial goals. By letting you compare loan offers from lenders across the country, we’ll help match you with the perfect product for buying your first home, consolidating student loans, starting your own business or simply getting out of debt. By providing multiple offers from the largest network lenders in a matter of minutes, we make comparison shopping easy and stress-free. To create the material presented above, we used the Federal Reserve’s Survey of Consumer Finances historical data from 1989 to 2016. All figures were taken from summary estimate data provided by the Fed and based on internal data. All dollar figures were inflation-adjusted to 2016 dollars. Do you like what you see? We encourage journalists to use any of the graphics included in the above piece for noncommercial purposes. Just make sure to give credit where it’s due by properly citing LendingTree.com in your coverage as well as providing a link back to this page.